This over the door hanger is perfect for my fine washables that I don't put in the dryer. It has enough air space for all laundry to dry in a timely manner. I've been looking for this for years. We had one when I was a kid, and my mother would hang things as she ironed them. As soon as I got it, I put it on the laundry room door. The first use for it I had was to get clothes ready for a trip. I matched up my outfits, then slipped them right into a garment bag. It has also come in handy for hanging damp clothes to finish drying. Over the door hanger is wonderful for my cleaner clothes. I am able to keep my clothes organized and se perated at tht same time. I don't have to stuff my closet any more. It is great for drying clothes, or hanging an attire for the evening. There are many uses for the clothes hanger. Great for a small room to hang clothes until they go to the closet. MY MOTHER TAUGHT ME HOW TO CUT CORNERS TO SAVE MONEY. THIS IS ONE WAY. I AM SO EXCITED YOU CARRY THIS PRODUCT.INSTEAD OF DRYING EVERYTHING, USE IT TO SAVE ON YOUR ELECTRICITY BILL. I use it to hold my hoodies. The product came a day early, and I was taking one of them with me on a trip in two days time. I was able to pack it up and take it with me. GOT THIS FOR A FRIEND,SHE LOVES IT. HOLDS A LOT. During warm months we hang this on the fence to dry clothes. In the winter we hang it on a door to dry the clothes. We use it for items that don't go in the dryer. The extra hanger capacity really helps since my closets are full. I was really impressed with the quality. I looked in every store in my area for any type of strong over door hangar and was unable to find anything suitable. 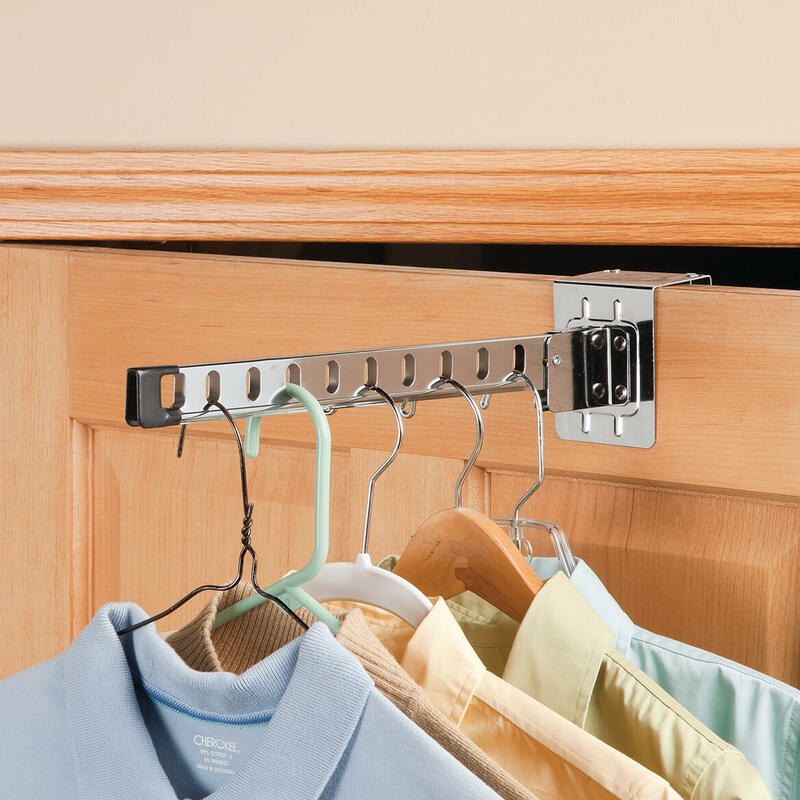 This does the job perfectly--is strong, holds large amts of clothing hangars for hanging up clothes right out of the dryer or creating extra storage in a room. I bought several since I could not find it anywhere locally. Even though this is supposed to go over doors, I cut off the back metal flap and screw it into the walls of my closets, laundry room, behind doors. Use molleys when fastening to walls and it works great - like a little extra clothes hanger when extra hanging space is required. I also put one in my garage with a pan underneath it to drip dry my delicate clothes. Great product! Only one worth the money! Very useful for hanging heavy coats and similar items! I agree with all of the great points that other reviewers have mentioned. In addition, the holders take plastic tube hangers not just the wire hangers shown. Great for when I iron to allow the shirts/blouses to dry before putting away. Also great anywhere you occasionally need drying or hanging space. One word of cauution, the green felt backing left color on my door so put something between the hanger back and your door. We have limited space in our laundry room and this item makes the chore so much easier. This is an amazing piece of equipment as it extends so hangers hang parallel to each other as in the closet. Then it drops so clothing on hangers lie flat on top of each other without wrinkling the clothing. One side of the over-the-door piece is not padded which caused a scratch on our door. Product is a little light for hanging clothes in as many wholes as there is. It will not stay on the door when it is in the down position. I have two and they work wonderfully and I need more. I Love this thing! I use it for ALL my cold water wash stuff and I am able to hang dry it all. I ran out of empty spots so I just HAD TO order 3 more!!!! I HIGHLY RECOMMEND this product and at this low price how could I resist?? I have been looking for one of these!! It's going to be perfect for hanging laundry from the dryer. Have used them before. Great space saver. When not in use, it folds flat against the door. We need extra storage space and don't want to have to drill into the door, so we chose this item. Not enough space inside closets so I'm hanging clothes on doors. I found some plastic over the door hangers but they bend under weight and drop off door, crumbling clothes to the floor. This item looks like it is perfect to meet my need. I needed some extra hanging space for clothes that I either do not put into the dryer or for items that are still damp after running through a drying.cycle. I have used this hanger over and over. It is a terrific item. Needed somewhere to temporarily hang up clothes after removing them from dryer. I have two of these & love them! They are really convenient when washing & hanging clothes. Reviews were positive and looks like exactly what I have been unable to locate in our local stores. I have used a similar one in my laundry room for years. It has finally suffered under many years of service and needs to be replaced. Needed a place to hang clothes when ironing, and this looked like a good sturdy choice. I ordered this for my father because he had one that he's using and wanted more. He's happy that we were able to find more. I have this door hanger & love it. I can't find it any place else. It is a great place to hang my clothes when ironing. What I was looking for and could not find in town stores. I have one I like and found I needed another. 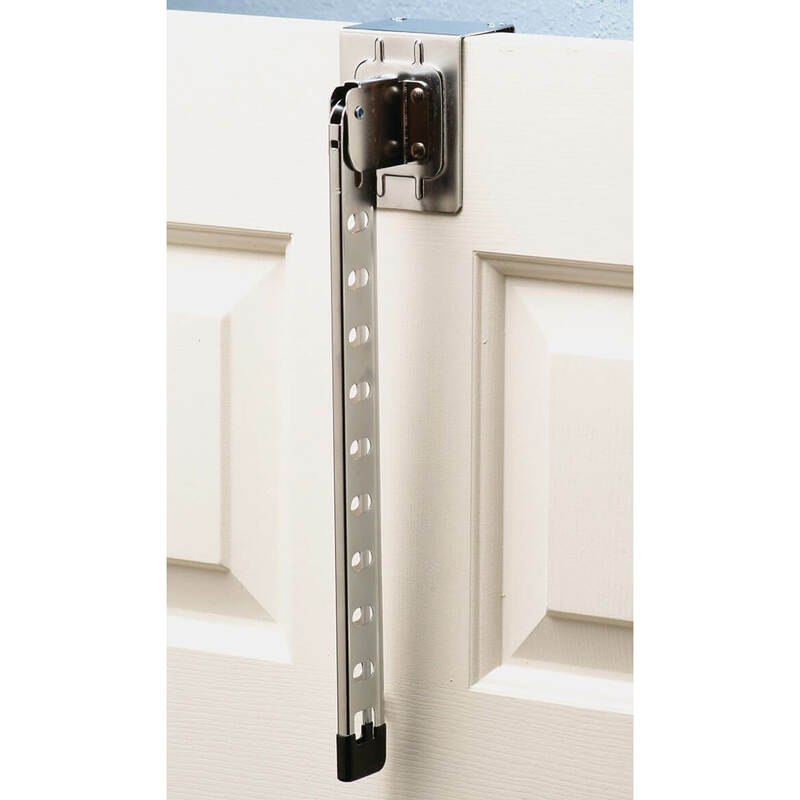 If you get the metal one, it'll fit over the bathroom door without keeping if from closing, like those thicker plastic door hangers. I have several items i don't put in dryer this comes in handy for those items. I use this to hang jewelry holders from. Need it to hang clothes that don't fit in closet. ONLY COMPANY I COULD FIND THAT CARRIED THE PRODUCT. THANK YOU! We are moving into a camper,so I need help storing stuff. I had previously used this item and a liked it. could not find in stores in my area . thank you. does this take all kinds of hangers? BEST ANSWER: Yes. The openings are 5/8" tall and 3/8" wide. The first opening is bigger than the others. It is 3/4" by 3/4" and is a square opening. If your hangers are bigger than these dimensions, you can try using the top edge of the bar. Hope that helps. 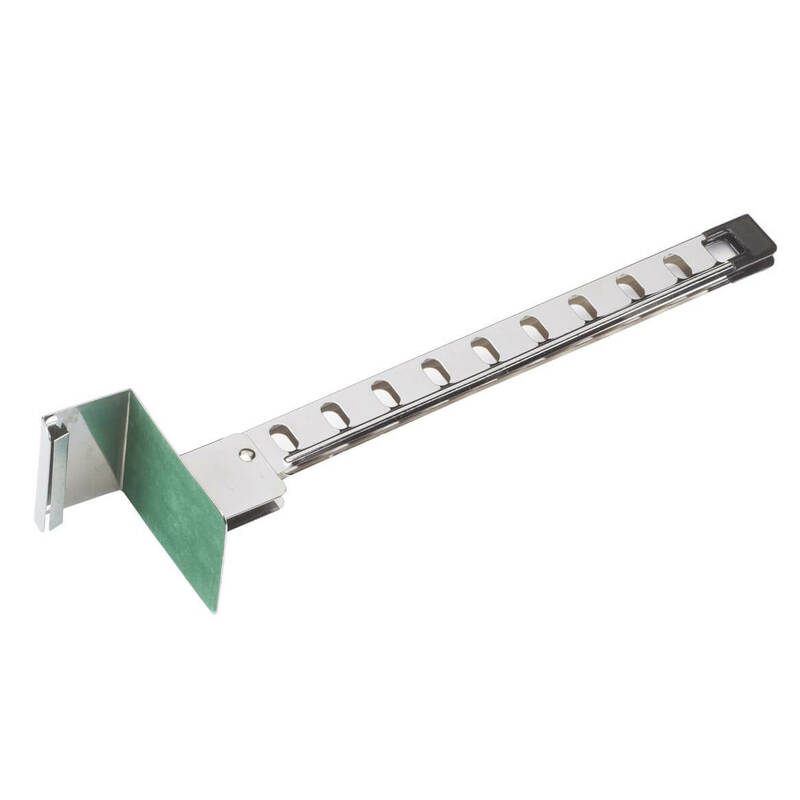 Yes it will accommodate many types of hangers - plastic, wooden, etc. The large plastic hangers don't do well on the over door hanger. We use all size hangers. Love the product.